"The arugula, I cannot find." According to the Jedi code, there is no emotion, there is peace; there is no ignorance, there is knowledge; and there is no death, there is the force. Oh, and if you're shopping for some Wookiee Cookies at your local supermarket, there is no hood. So says one Tesco grocery store in Wales, which busted a Jedi for shopping while cloaked. And the Jedi is striking back with a charge of religious discrimination. Daniel Jones, founder of the International Church of Jediism, was told he couldn't wear a hood while shopping in the Tesco, according to the Guardian. 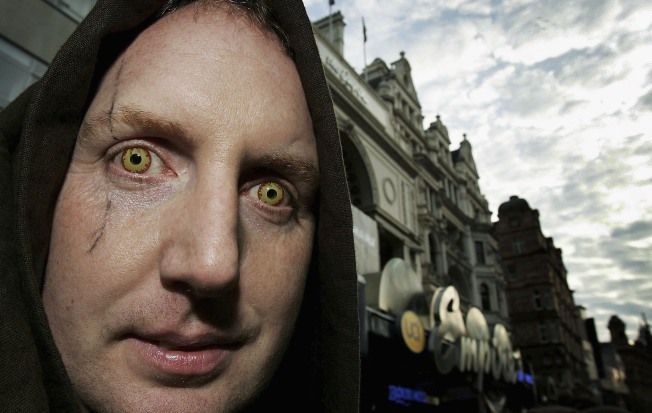 He claimed that his religion, which allegedly has 500,000 followers worldwide and could be the fourth most-popular religion in England, states that he should wear the hood in public. So he's thinking about taking legal action, the Guardian reported. Now, we're all for religious expression, and we're all about Star Wars geekdom, but we're siding with Tesco on this one. Why? Because they're taking on this potential lawsuit with a great deal of professionalism and respect. OK, OK ... so they're just making fun of the dude. And we're eating it up. Tesco said they're not sorry for making Obi-Wannabe Kenobi remove his lid in their store because they said the "real" Obi-Wan, Yoda and Luke never wore their hoods inside. They said Jones, also known by his Jedi name Morda Hehol, isn't banned from their store, but that "Jedis are very welcome to shop in our stores, although we would ask them to remove their hoods." Come on, Morda, even a young Padawan knows that!